As a cinematographer who owns lenses designed for various formats, I am often asked "will this lens work with my camera?" Or, "will this lens cover 8K?" Or, "Will this lens cover full frame." Or, "what will your full frame lenses look like on my camera's Super-35 sensor." My hope is that this article will help answer some of those questions. 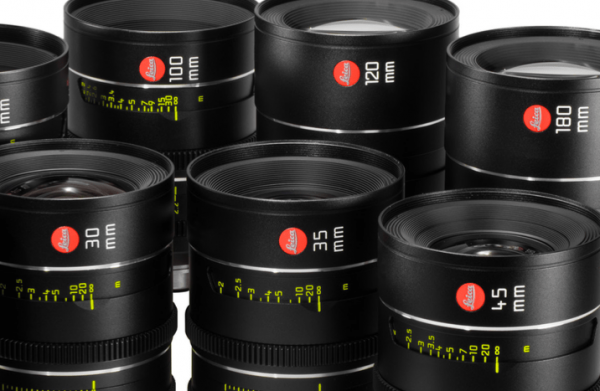 With the release of more high-end video cameras with larger sensors like the ARRI Alexa LF, Panavision DXL2, RED MONSTRO, and the Sony Venice, we have more choices than ever when it comes to formats and lens options. However it’s important to know the differences as well as what results should be expected before selecting your sensor size and lenses. 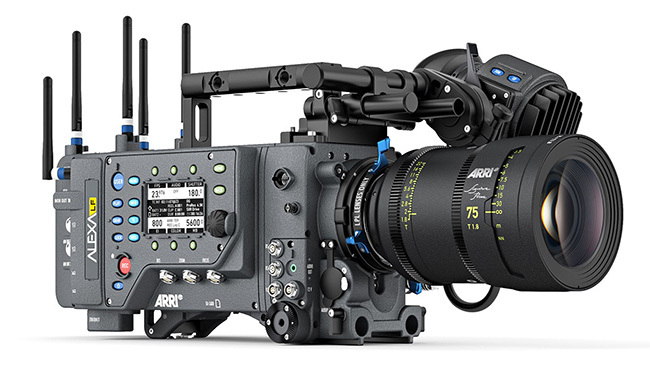 The new ARRI Alexa LF full-frame camera. There are many formats to choose from. Digital or film? If film, which format? If digital, what camera and sensor size? There is no single "best" format that is right for every project or situation. Motion picture film formats are fairly straight forward: 8mm, 16mm, 35mm, 70mm. These are literally measurements of the physical size of film used to capture the images (in this article, I won't dive into exactly how the film is measured and what direction it passes in front of the camera). Today with digital cameras, we have more formats than ever: 1/2”, 2/3", Micro Four Thirds, Super-35, DX, APS-C, Full Frame, Vista Vision, etc. All these formats need lenses, and the lens market is bigger and more confusing than ever. Also, not all lenses work with all formats, and not all formats are the right choice for every project. Sensor size is the physical size (area, not number of pixels) of a camera’s image sensor, usually measured in mm width x height. A Full Frame digital sensor like the ones found in a Canon 5D, Sony a7S II or the Sony Venice, as well as traditional 35mm still photography film, all have areas that measure roughly 36x24mm. 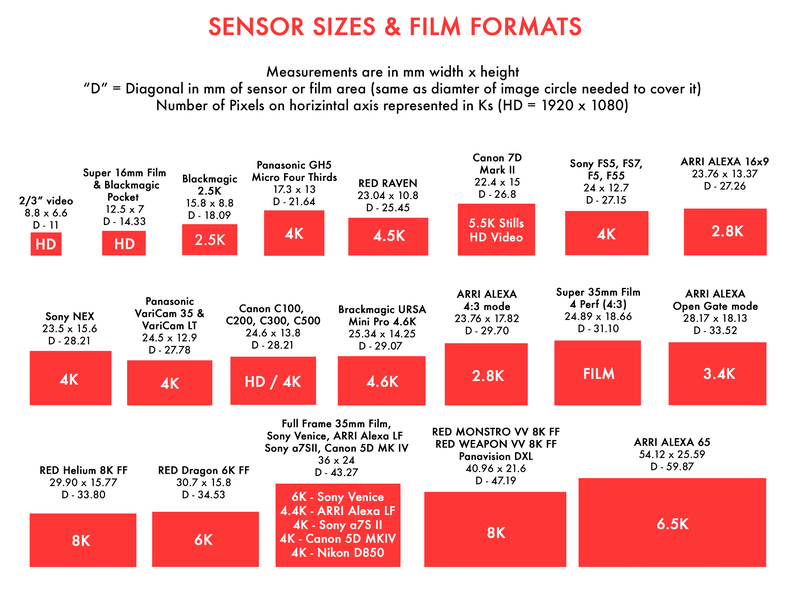 For the remainder of this article this format will be referred to as “Full Frame.” In the chart below the red rectangles represent the relative physical size of many common cameras and formats. 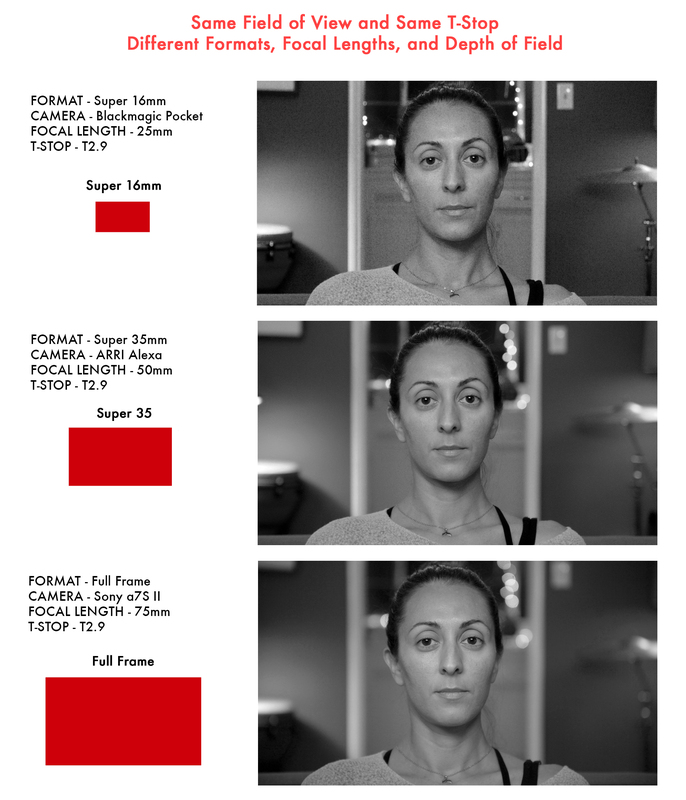 For film, resolution is the term used to describe how much detail can be resolved usually measured in line pairs (lines per mm or lines per inch). For digital sensors, according to international standards, it’s accepted to use the term “Number of Recorded Pixels” or “Number of Effective Pixels.” This is the number of individual pixels on a given sensor that contribute to the final image. This can be measured in horizontal x vertical. For instance 1920 x 1080 is the standard pixel count for HD cameras. We are now abbreviating these numbers by using "Ks" (2K, 4K, 6K, 8K etc.). For instance 4K represents roughly 4,000 pixels in the horizontal axis of a 4K image sensor. I say “roughly” since a common “4K” pixel count is actually 3840 x 2160 pixels, and there are multiple pixel counts that are accepted as “4K.” In still photography digital cameras, pixel count is often measured in “megapixels.” One megapixel = 1 million pixels. The Canon 5D Mark IV is 30.4 megapixels, which is about 30,400,000 pixels, which is 6720 x 4480 pixels, and in theory could also be called 6.7K. Field of view or more accurately stated, "horizontal angle of view" is a measurement in degrees along the horizontal axis to determine just how much of the world you will see when looking through a lens. For example an ultra wide-angle lens like a 16mm fisheye lens (made to cover Full Frame sensors) will have a 180° horizontal field of view. If you placed your camera and 16mm fisheye lens in a small square room, standing close to one wall, in the center of that wall, your camera would see the wall across from you as well as the walls to your left and to your right. A super telephoto lens like a 500mm will have a very narrow field of view of only 5° on a Full Frame camera, and you would only see a small piece of the wall directly across from you. This tool was created to help people familiar with traditional 35mm photography focal lengths figure out the field of view of a lens based on an equivalent focal length resulting from using cameras with sensors smaller than 35mm film. For example photographers and videographers accustomed to the field of view they see when looking through a 50mm lens mounted on a Full Frame Nikon D810 ("FX" format in Nikon speak) might wonder what equivalent focal length will give them the same field of view on a Nikon D500 which has a smaller "DX" format sensor (which is similar in size to APS-C and Super-35 sized sensors). There is a formula to figure it out. To find the equivalent focal length to give you the same field of view when using the smaller sensor of Nikon DX cameras, you use a crop factor of 1.5x. To find right the lens, you divide 50mm by 1.5, which gives you about 33mm. Since you probably don't have a 33mm lens, using a 35mm prime lens on a DX format Nikon camera like the D500 will give you roughly the same field of view as a 50mm on your Full Frame Nikon D810. If you want to go the other direction, and see what focal length you need on your Nikon D810 to give you the same field of when you use your Nikon 24mm f1.4 on your Nikon D500, just multiply 24mm x 1.5, which gives you 36mm. So to get roughly the same field of view on your Nikon D810, use a 35mm lens. "Crop Factor" is really just another mathematical way of explaining changes in "Field of View" caused by using cameras with different sensor sizes. For example, a 50mm lens on a Full Frame camera has a horizontal field of view of 46°. That same 50mm lens has a narrower field of view of about 30.67° on the smaller DX sensor. The factor is still 1.5x. A lens' image circle refers to the light or image projected out of the rear side of a lens, for our purposes onto a camera’s sensor or film plane. A lens projects a circular image, not rectangular. We simply crop the circular image into rectangular shapes with various aspect ratios. The diameter of the image circle is measured in mm. It is very helpful to know a lens’ image circle, because if you know the image circle, you know how large of a sensor a lens can cover. For instance in order for a lens to cover the entire sensor of a Full Frame camera like a Canon 5D or the Sony Venice, it would need an image circle with a diameter of 43mm. Not every manufacturer makes this information easily accessible, especially with older lenses, so research or testing is needed to verify if a lens can completely cover certain sensors. In the images below it's easy to observe this lens' complete image circle. This lens was orginally designed to cover Super-16mm film. When used on a camera with a Full Frame sensor we are able to see the lens' entire image circle as well as the rectangular cropped portion which will be end up being the final image. A lens' image circle determines what sensors it can cover. With all the different formats and lenses to choose from, it can get confusing. A lens can "cover" the sensor size and film format it was designed to cover, as well as any formats smaller than that. However most lenses can't cover formats larger than the one they were intended to cover ( there are a few exceptions including some high-speed lenses and some primes with longer focal lengths as a result of their specific optical designs). If a lens was designed for Super-35 and APS-C (which are very close in size), it will successfully cover the sensors of Super-35, APS-C as well as smaller sensors like Micro Four Thirds and Super-16. However, it more than likely will not cover larger sensors like the ones in Full Frame cameras, and even larger sensors like the one in the ARRI Alexa 65. To add to the confusion it has become popular to measure a lens' coverage (image circle) in "Ks." To say a lens “covers” 4K, 6K, 8K, is flawed. Since Ks are a measure of pixel count not the physical size of an image sensor, using Ks in this way is problematic. When RED went from their original 4K sensor, to a 5K sensor and then a 6K sensor, there was a constant relationship between pixel count and sensor size. So as the number of pixels grew, so did the size of the sensor. Therefore this method of discussing a lens’ coverage could in theory make sense for RED cameras of that time, but it couldn’t be applied to other cameras from other manufacturers. After RED released their Helium sensor, it couldn't even be applied to RED cameras any more! If you look at the comparisons below, you can see how there is no relationship at all between "Ks" (pixel count) and sensor size. "A 50...is a 50...is a 50..."
All lenses of the same focal length, regardless of what format they were designed to cover, "see" the world in the same way, but the size of their image circles can vary. By that I mean a 50mm lens designed to cover a camera that shoots 16mm film, "sees" the world in the same way as a 50mm lens designed to cover a Full Frame digital camera. The difference between the two is how much of the world they are able to see and project onto a camera's sensor. In the images below, the same scene was shot 3 times with the same camera, with the same Full Frame sensor. The subject stayed in the same place. The camera never moved (always 4' 6" from her eyes to the sensor) and the T-stop stayed at T4 for all three lenses. As you can see, the magnification of the scene is the same. The size of the woman's face, the geometry of the room, and the depth of field are the same with all three 50mm lenses. The only difference is each lens' image circle and therefore how much of the room you are able to see. "I NEED 4K AND FULL FRAME..."
The increasing number of sensor sizes and lens options, has made things more complicated than ever especially with all the lens adapters available and cameras with interchangeable lens mounts. There are also a lot of companies rehousing lenses, giving filmmakers the opportunity to use lenses that were not originally designed for motion picture use. With so many options it can be overwhelming when gearing up for a project. 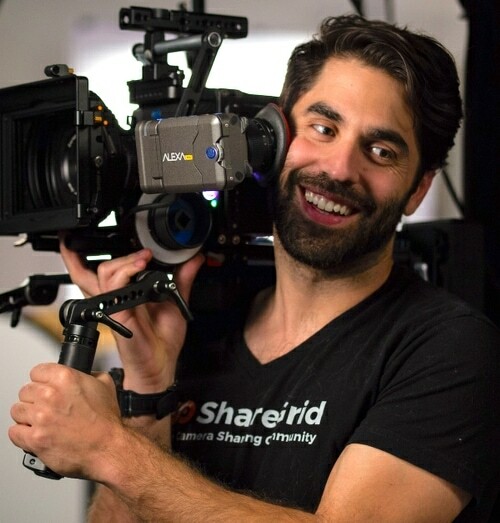 A director might say, “I really want to shoot this project in 4K and Full Frame.” So the DP lines up a rental for a Sony a7S II, which shoots Full Frame at 4K. Then the producer says, “I was able to get a great deal on ARRI/Zeiss Ultra Primes!” That’s great news for their budget, but if the DP doesn’t know the right information about those lenses, or doesn’t do research or doesn’t test them out before the shoot, he or she will find out the hard way that those lenses were not designed to cover Full Frame, and the DP will have to use the "center crop" feature on the a7S II, and now that project has to be recorded at Super-35, 1920 x 1080, which is not what the director wanted. In that scenario, they needed to track down lenses designed to cover Full Frame or larger sensors, and there are more lens options than ever to cover these big sensors. Leica just announced their new "Thalia" line of primes based on Leica medium format lenses originally designed to cover a huge 60mm x 60mm film format. These lenses can be used on the giant image sensor found in the ARRI Alexa 65. That means these lenses will also cover any sensor or film stock that is smaller than the Alexa 65 (which is just about every current camera and format). 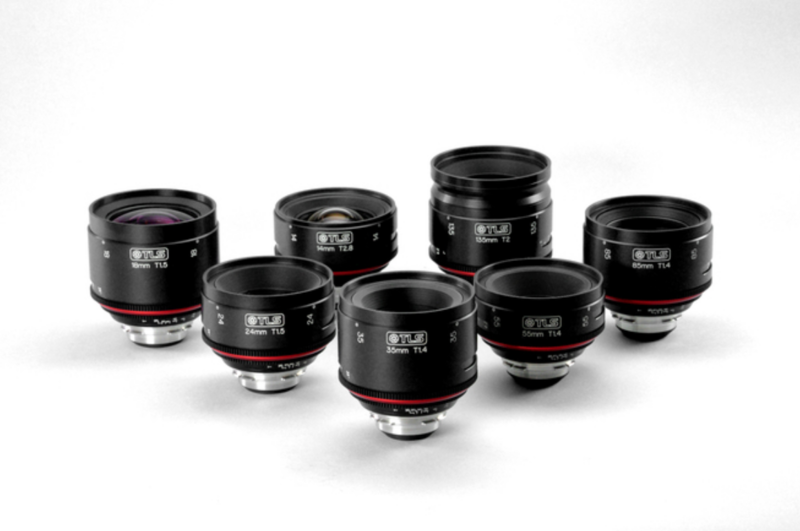 If you happen to own Super-16 prime lenses you will be able to use them for Super-16 film and similarly sized sensors, and any format smaller than that ( 8mm film, 2/3”, or on many of the “cropped sensor” formats available on cameras like the ARRI Amira, Canon C300 MKII, Sony F5, F55, FS7, Panasonic Varicam LT and pretty much any RED camera). The ARRI/Zeiss Ultra Primes mentioned earlier in the hypothetical scenario are in the middle of the pack as far as sensor coverage goes. They were designed to cover Super-35mm film, so they can’t cover larger formats like Full Frame or Alexa 65, but they can be used on any smaller formats, like Micro Four Thirds, Super-16, 2/3” etc. In the examples below, you can see how three 25mm lenses designed for different formats, shot on a camera with a Super-16mm sized sensor, at the same T-stop will produce images that have the same field of view, the same magnification, and the same depth of field. Therefore a 25...is a 25...is a 25. These three 25mm lenses were designed to cover different sensor sizes, but because they were all designed to at least cover a Super-16 sized sensor, they give us virtually identical shots. 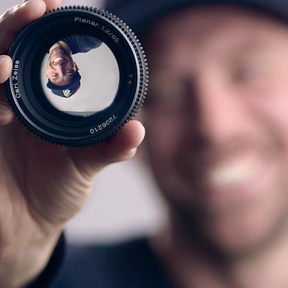 ARE LARGER-FORMAT LENSES THE ONLY LENSES YOU'LL EVER NEED? One could come to the conclusion that the only lenses you will ever need are some rehoused medium format lenses because they will work on any current camera format, right? It’s not that simple. For instance the 24mm in the Thalia lens set mentioned earlier has a maximum aperture of T3.6, which compared to prime lenses designed for Super-35 or even Full Frame (which can be as fast as T1.5, T1.4, or even T1.3), is a somewhat slow lens requiring more light. What if you have a project that will be shot on an Ursa Mini Pro, shot mostly at night and relies upon practical lighting or available light? Since the Ursa Mini Pro performs better at lower ISOs, you decide that you need lenses that can open up to T2 at least, but T1.4 would be even better. If that’s the case, larger format lenses like the Thalia primes would not be the best option, and it might be better to get something like Zeiss Super Speeds, which have a maximum T-stop of T1.3. Both the Thalia 24mm and the Zeiss Super Speed 25mm will give you almost identical fields of view, but the Zeiss Super Speed requires less light, and has the ability to give you shallower depth of field should you choose to open up to wider apertures. It’s also important to note, the widest lens in the Thalia set is 24mm. When shooting on Super-35 or smaller formats, it’s very common to shoot focal lengths wider than 24mm to achieve a wider field of view, so if you only had that set of Leicas, you couldn’t shoot any really wide shots on cameras with smaller sensors. Leica didn’t design any focal lengths wider than 24mm for the Thalia lens line because on the formats they were designed for, a 24mm lens has an extremely wide field of view. A 24mm T3.6, shot at T3.6 on an Alexa 65 can provide a wide field of view that still has shallow depth of field. When shooting on Super-35, to get a shot with the same field of view and depth of field, you’d need a lens that was roughly 13.5mm and T1.8. So depending on the look you’re going for and the size of the sensor you are using, the Thalia 24mm T3.6 may leave you looking for wider focal lengths with faster T-stops. So as amazing and beautiful as the Leica Thalia lenses are on an Alexa 65, they might not be the best choice for projects using smaller sensors. Then why doesn't someone just design large format lenses that cover the huge Alexa 65 sensor, have a maximum aperture of T1.3, and make focal lengths wider than 24mm? Then you could buy one set of primes that you could use on every job! Physics is one of the big reasons why we will likely never see a lens set like that. For example an 18mm lens that could cover the Alexa 65's sensor and was T1.3 would be absolutely gigantic. This theoretical prime lens would probably weigh 20 pounds and have the diameter of a volleyball. It would also be very difficult to actually design and build. The individual glass elements would be enormous and would be difficult to match the tolerances achievable with smaller format high-speed lenses. Another challenge in designing these ultimate lenses would be cost. The cost to design and manufacture such a lens would make the resulting lens so expensive, no buyer outside of NASA could afford to own it. There is also practicality to think about. If this hypothetical lens was somehow built, it would be impractical to even shoot it at T1.3, especially with medium and longer focal lengths. If you were using a theoretical 85mm T1.3 (designed to cover the Alexa 65 sensor) on the Alexa 65 at T1.3, the depth of field would be so shallow, you would only be able to keep a thin sliver of an object in focus. This effect could be interesting for specific styles and scenes, but for most shooting situations, such extremely shallow depth of field could be distracting, and your focus puller would probably quit after the first shoot day. The DP would likely end up stopping the lens down to T4 or T5.6 anyway, and all the extra aperture and glass would go to waste. As exaggerated as the above example is, it’s a good demonstration of why we benefit from having different sensor sizes and film formats. 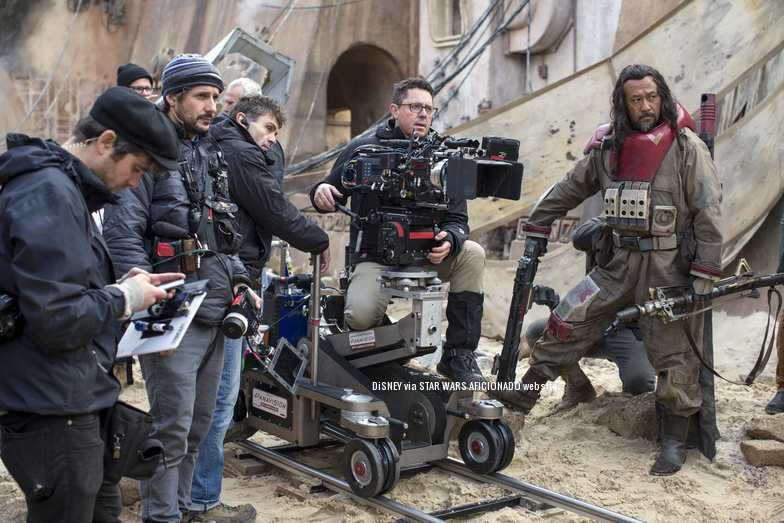 For ROGUE ONE: A STAR WARS STORY, shooting on Alexa 65 with big, heavy, vintage Panavision Ultra 70 anamorphic prime lenses was a great recipe for achieving epic, large-format images perfect for the big screen. 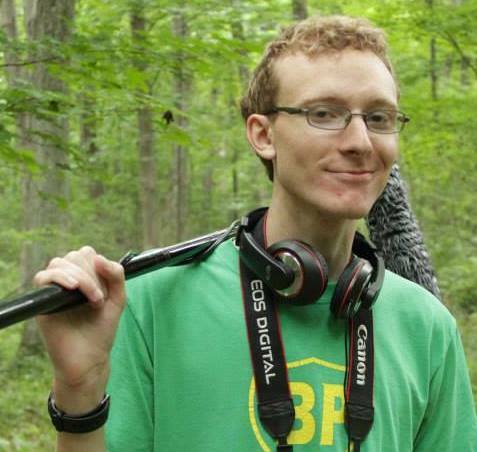 That production also had the budget and crew to support using gear that is bigger, heavier, and slower to set-up. 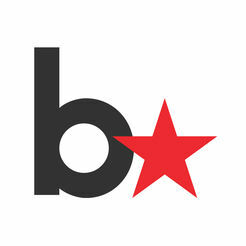 However for a run-and-gun documentary, shooting on a smaller format like Super-16, or a comparable digital format like shooting 2K "center crop" on a Sony F55, shooting 4K on a RED Helium or using a Blackmagic Pocket Cinema Camera, can result in a smaller, lighter camera, smaller lenses, typically faster lenses that need less light, cheaper rentals and possibly even a smaller crew, needing less set-up time. Even smaller than Super-16, the 2/3” sensors in the cameras used for live sports, mean it’s actually possible to build a lens like the Fujinon XA101x8.9BESM/PF that can go as wide as 8.9mm and as long as 900mm (1800mm with its built-in doubler engaged!) and has a maximum aperture of f1.7…wow. To build a lens that could cover that massive 101x zoom range and cover a much larger sensor like that of a Super-35mm camera like a Canon C300 or Sony FS7 at f1.7 would be the size of a Civil War era cannon and probably weigh as much. The Fujinon mentioned above costs $233,490, so if you needed to build its Super-35 bigger brother what would it cost, half a million dollars? To build one that covered an even larger format like Full Frame or the Alexa 65, would probably be the size of a minivan and cost 5 million dollars. 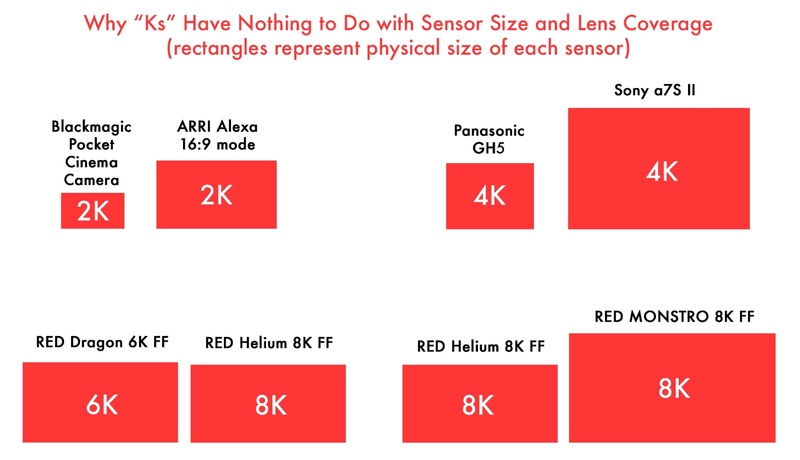 The physical and financial reasons for having all these different sensor sizes might be more obvious than the aesthetic differences that go along them. The most obvious difference between smaller formats and larger formats is depth of field. With small formats like 2/3” or Super-16, you have more depth of field. The background and foreground stay in sharper focus relative to the subject. In larger formats like Super-35, Full Frame or Alexa 65, depth of field is much shallower. Foregrounds and backgrounds appear more out of focus relative to the subject, which separates the subject from the background, and gives the image an overall more three-dimensional feel. The difference in depth of field between Full Frame and Super-35, using lenses that will give you the same field of view, is about 2 stops. Therefore a camera with a Full Frame sensor shot at T2.8 has the equivalent depth of field as a Super-35 sensor at T1.4. Since you need wider and wider focal lengths to get a wider field of view on smaller formats, the resulting images tend to feel flatter or more compressed. On the flip side, when using larger formats, you are using longer focal lengths to achieve the same field of view, which means a more natural perspective that more closely resembles the field of view of our own eye-sight. Shooting on a camera with a Super-35 sized sensor like a Canon C300, Sony FS7, or an ARRI Alexa Classic with a 50mm prime lens gives us a specific field of view. To create that same frame, or more accurately stated, a frame with the same field of view on an Alexa 65, you would need to use a 90mm lens (of course it has to be a 90mm lens that was designed to cover the Alexa 65's sensor). 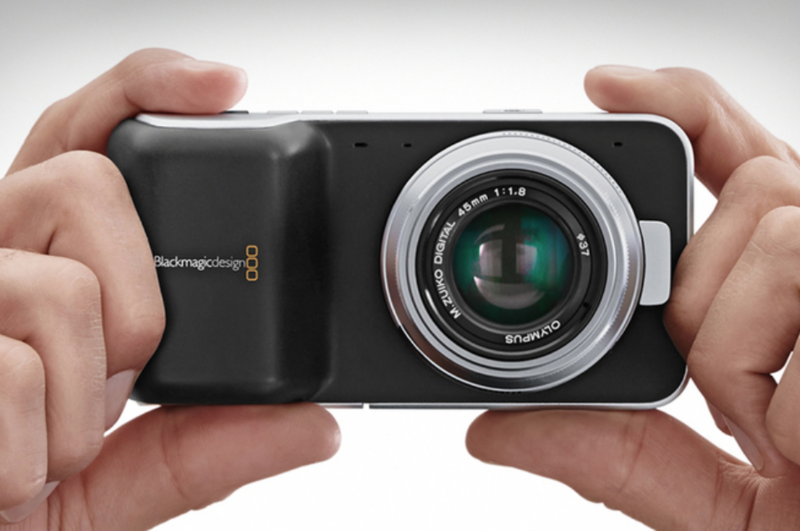 On a camera with a 2/3” sensor you would need a 20mm lens to give you the same field of view. 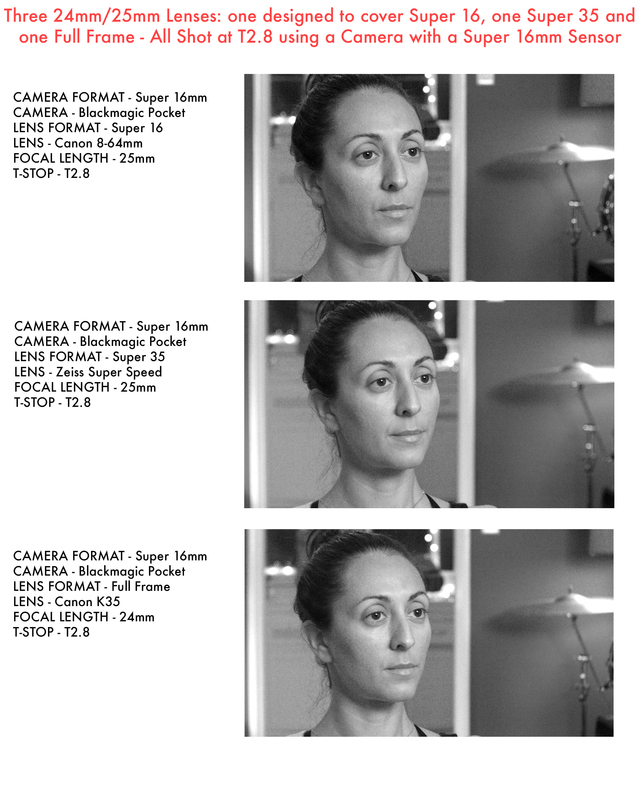 Those differences in focal length to achieve the same field of view result in images that have different depth of field, compression, and overall feel. There are more choices than ever for acquisition format and more sensor sizes are popping up every year. New lenses seem to be released monthly. With all these options at our fingertips, it means we have so many creative possibilities. However, more than ever we need to make sure to consider all the variables before deciding which format is best for a given project. 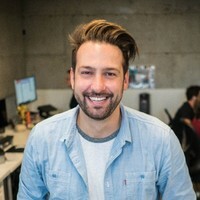 What’s the style of the project? Do you need a physically small camera and lenses? Will you be in a low-light situation? Do you need primes, zooms, or both? Do you want more or less depth of field? Do you have limited set-up time? What’s your budget? You also need to know which lenses are compatible with which cameras and formats. The last thing you want is to choose the wrong equipment, which leaves you fighting with your gear instead of doing your job. There are more tools than ever available to filmmakers, and it’s up to you to figure out which ones are the best for your project. 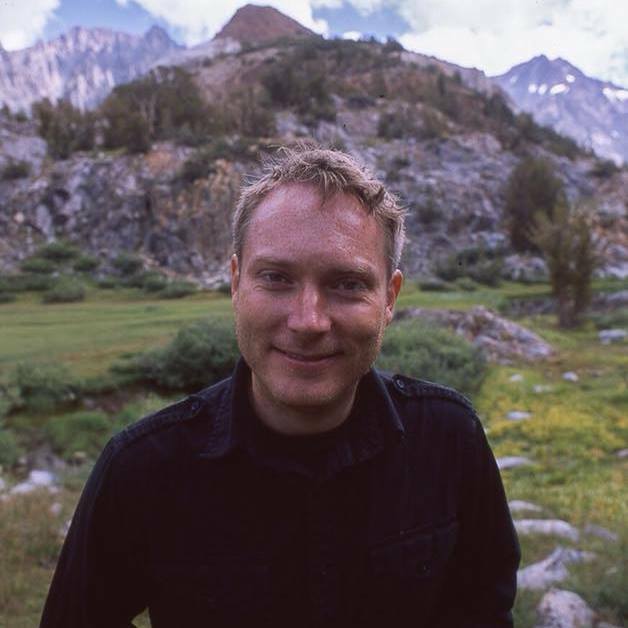 Mark LaFleur is a Los Angeles based cinematographer and lens addict.